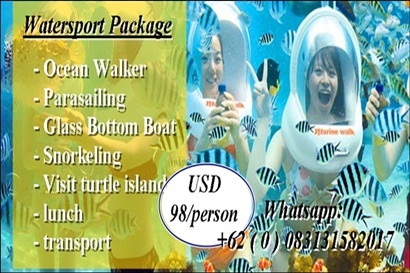 Ocean Walker Watersport package is great package that you can book when in Bali island. Which is the tour package already included return transport, parasailing, Glass bottom boat, snorking, visit turtle island and lunch. Best price guarantee, easy booking means you can book now and pay upon arrival, no cancellation fee and special price for group booking.